In this chapter we will study the asymptotic behavior of solutions of the Neumann boundary value problems in strongly perforated domains. We will consider domains of three types: strongly connected domains, weakly connected domains, and domains with accumulators (traps). 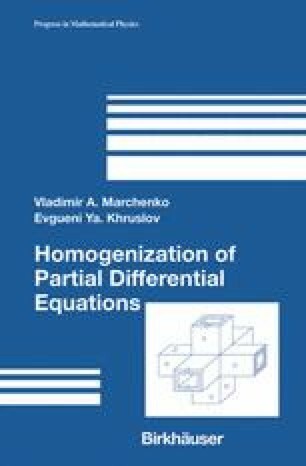 We will introduce quantitative mesoscopic (mean local) characteristics of domains (conductivity tensor and connectedness matrix) and derive characteristics of domains (conductivity tensor and connectedness matrix) and derive homogenized equations, which appear to be qualitatively different, depending on the type of domains.